Evolve prides itself on being a holistic provider of quality pet foods and unlike some, they actually live up to their claims and promises! This healthy and balanced dog food contains no grains, artificial colors or flavors. Turkey is the first ingredient in this slow-baked food. What is the importance of slow baking you might ask? Baking slower helps preserve the vitamins, minerals, and nutritional composition of the food so your dog gets more out of it. 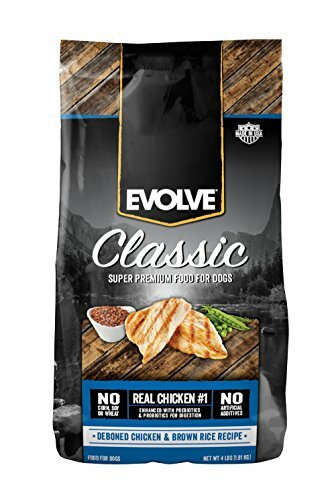 Here are some other reasons Evolve is a dog food that Scout has no problem recommending to any dog parent! No cheap fillers like animal digest or low-quality animal by-products. Healthy fats and oils from chicken, flaxseed, and fish meal. Can be fed to adult dogs and puppies. Turkey, Chicken Meal, Whole Ground Garbanzo Beans, Whole Ground Peas, Sweet Potatoes, Chicken Fat (Preserved With Mixed Tocopherols), Pea Starch, Pea Protein, Turkey Meal, Natural Chicken Flavor, Flaxseed Meal, Potassium Chloride, Dried Chicory Root, Dried Cranberries, Dried Blueberries, Dried Carrots, Minerals (Zinc Sulfate, Copper Sulfate, Magnesium Sulfate, Calcium Iodate, Sodium Selenite), Vitamins (Choline Chloride, Vitamin A supplement, Vitamin D3 supplement, Vitamin E supplement, Niacin, D-Calcium Pantothenate, Pyridoxine Hydrochloride (Source of Vitamin B6), Riboflavin Supplement, Folic Acid, Vitamin B12 Supplement), Dried Lactobacillus Acidophilus Fermentation Product, Dried Bifidobacterium Animalis Fermentation Product, Dried Lactobacillus Reuteri Fermentation Product. Transition: Start puppies on moistened Evolve as they start to eat solid foods. Evolve Grain-Free Turkey, Garbanzo Bean, & Pea Recipe dry dog food is a great choice for dog parents that are looking for a quality, affordable grain free dog food for all life stages. The formula of healthy proteins, fats, vegetables, fruits, and probiotics provides good immune system support, what is needed for healthy skin and coat, and fabulous digestive support even for dogs with sensitive stomachs.